How to invest in stocks and outperform fund managers? You can create a stock portfolio of companies that you believe in and hope that these companies will grow and make you rich. But to get good results over the long-term, you will also need to spend lot of time learning about stock market. If you don’t have time and will pick stocks without doing any research, you risk getting burned. For example – this is how GoPro stock chart looked like after IPO – price shot up 300% from $30 to $90 in just 3 months. Imagine, how high it could go in 2 years? Let’s say, you would have invested $990 and bought 11 GoPro shares in Oct 2014, paying $90 for each share. Continue reading How to invest in stocks and outperform fund managers? Posted on March 20, 2016 March 20, 2016 Categories EnglishTags etf, gopro, index funds, investing, Jack Bogle, S&P 500, stocks, Vanguard, Warren Buffett4 Comments on How to invest in stocks and outperform fund managers? No manual selection of specific loans, use Auto Invest feature to make investments automatically and avoid spending my time. Invest only in loans that have Buy Back guarantee. Even if Mintos and Twino have different returns for similar type of loans, invest in both of them to diversify and in worst case scenario loose only 50% of money in case one of these P2P platforms go bankrupt. Invest only in loans with the shortest term – 1 month – to get the best liquidity. So if I want to get back all my investment, it should take maximum 1 month for any remaining loans to be repaid, or in case – if some of them are paid late, then maximum another 1-2 months for the Buy back guarantee to pay back the late loans. Let’s say that you have 1000 EUR in your account and would like to invest it. Guess how much you would earn from fixed term deposit? 0.1% per year. So by “freezing” your 1000 EUR for 1 year you would earn 1 EUR. You make a money deposit to your bank with condition that the money cannot be withdrawn for a certain period of time. Depending on the chosen term, bank will offer you different interest rates. 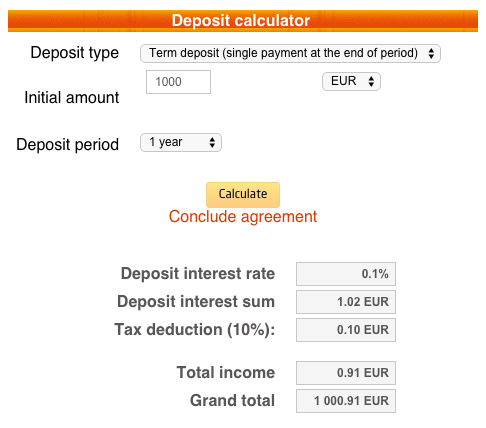 For example – you deposit $1000 for 1 year, and get 1% interest. After the year has passed, you will have earned 1% of $1000 or $10. 1. Your money is frozen for the selected period of time and you cannot use it. In case you decide to withdraw it sooner, you will need to pay a penalty that will most likely be higher than the interest rate. 2. In most stable countries inflation is higher than interest rates from time deposits, so if the interest rate is 1% and inflation is 2%, then after 1 year you will have gained $10 from investment and lost $20 to inflation. In short – you freeze your money, let bank make profit from it and get back less that you had.